Registration for Spring Semester. Registration for Spring Semester courses is under way. Political science majors and minors should consult with their academic advisor(s) to discuss their course choices and their progress through the requirements of the SAGES Program, the College of Arts and Sciences, and the Department of Political Science. Seniors who intend to enroll in POSC396 should discuss their ideas about possible capstone topics with faculty members about their availability for supervising capstones. The Department of Political Science is offering a range of courses this spring, several of which are particularly timely, given current political events around the world. For just a few examples, Professor McMann is offering her Politics of Russia course; Professor Moore is offering his Revolts and Revolutions course; Professor Lee is offering The Politics of Development of the Global South; Professor Schroeder is teaching The US and Asia; and Professor Posner is teaching The Politics of the European Union. Professor Buchler is offering an experimental version of POSC321 Politics and Money, built around the use of modern science fiction literature to explore topics in money, politics and power. Professors McMann and Posner will be on sabbatical for the 2018-19 academic year; for those students hoping to take a course with either of these faculty members, think about taking a course this spring semester. A list of courses offered this spring can be found here. Internships. As the Newsletter and the Department’s webpage indicate, internship opportunities abound for interested students. Now is the time to start preparing for an internship for summer 2018. For political science majors, the Wellman Hill Public Service Internship competition is under way; see here. Although the deadline for applications has not yet been announced, the deadline is generally in early February. The Wellman Hill application process requires identification of likely internships for which the candidate intends to apply. Internship opportunities are listed on the Department’s webpage, and most Newsletters publicize our most recent internship news. See this Newsletter’s internship opportunities with the Cleveland Foundation (deadline January 22, 2018), the US Department of Defense, and the Cleveland Hillel Foundation (deadline January 31, 2018). Note that the deadlines for these internships, and for the Wellman Hill competition, are fast approaching; some of these programs (e.g. Wellman Hill) require letters of recommendation from faculty members. Please feel free to speak with any of our faculty concerning your internship interests and how to apply for internships. Careers Colloquium for Political Scientists. Our double alumnus Chris Hook (POSC BA 2003, MA 2004) was on campus last week, giving a public lecture on his experience working in the Departments of Justice and of Housing and Urban Development (Managing Change in Times of Transition: How to Adapt and Succeed for Different Attorneys General, Secretaries, and Administrations). Chris also held an informal Careers Workshop and emphasized the importance of the Pathways Program in the US federal government for both internship opportunities and employment for political science students. You can find information about the Pathways Program here. Future Employment. For those wondering about career opportunities and lifetime career success for political science majors, see this good news in an article in the New York Times. “In the future days, which we seek to make secure, we look forward to a world founded upon four essential human freedoms. The first is freedom of speech and expression–everywhere in the world. The second is freedom of every person to worship God in his own way–everywhere in the world. The third is freedom from want–which, translated into world terms, means economic understandings which will secure to every nation a healthy peacetime life for its inhabitants-everywhere in the world. The fourth is freedom from fear–which, translated into world terms, means a world-wide reduction of armaments to such a point and in such a thorough fashion that no nation will be in a position to commit an act of physical aggression against any neighbor–anywhere in the world. Check out the photos from the annual Political Science Careers Colloquium, which takes place during the fall semester. This year featured Chris Hook (BA 2003, MA 2004), a Budget Analyst for the Department of Housing and Urban Development. Like us on Facebook! Our department will be regularly posting events, opportunities, and general information to our page. Andrew Healy is known among academics as an incisive scholar of voting behavior. He has co-authored important articles on research methods, such as telephone interviewing; on efforts to increase voter turnout; on partisan bias; and especially on retrospective voting. But he also has a deep interest in sports, and is on leave from his professor job now to work for the Browns. So what do the two kinds of analysis have in common, and what is different? Join us for a discussion that should illuminate three topics – politics, football, and statistical research. Hosted by the Andrew Goodman Foundation’s Vote Everywhere movement. Panelists will be invited to share their perspectives on a variety of interconnected political and scientific issues in a moderated discussion format. Students also will be given the opportunity to ask questions. Lunch will be provided. This panel will discuss how can Ohio avoid unemployment, but maintain a leader in manufacturing in the age of automation. Does manufacturing still matter? Nonmember tickets are $35. This exhibit examines photographers’ responses to the social upheaval and economic distress that characterized American life in the 1930s. Get an inside look at the school’s top-ranked master’s programs in social work and nonprofit management. Author Ibram Kendi will discuss State Violence and the Antiracist Struggle. This is a free event, but registration is recommended. Join the Center for Local and Global History for an in-depth look at the photographers who captured Cleveland from all perspectives and learn about the techniques that make their work special. This is a free event. Join Kent State University Professor Steve Rugare as he shares details surrounding the design of the facility built for the 1936 and 1937 Great Lakes Exposition. This is the story of how America’s first women soldiers helped win World War I, earned the vote, and fought the U.S. Army. The Pathways Program in the US federal government offers internship opportunities for political science students. The Cleveland Foundation has conducted a summer internship program since 1999 that provides talented and diverse undergraduate students and recent college graduates an opportunity to work with Cleveland-area nonprofit and public sector organizations in an 11-week paid internship. Interns also participate in and coordinate weekly seminars highlighting key organizations and programs being conducted in the local nonprofit and public sectors. Applications are due January 22, 2018. The Cleveland Hillel Foundation Summer Internship Program (SIP CLE) is a unique paid summer internship program open to Jewish students who will be going into their junior or senior year in the fall. Interns work for ten weeks and participate in innovative programming including exclusive excursions around Cleveland, professional development seminars, and opportunities to interact with civic and community leaders. The application deadline is January 31, 2018. Current students enrolled in a wide variety of educational institutions from high school to graduate level, with paid opportunities to work in agencies and explore Federal careers while still in school. The Minority Fellows Program (MFP) is a fellowship competition for individuals from underrepresented backgrounds applying to or in the early stages of doctoral programs in political science. This fellowship would require 15-20 hours per week, beginning January 2018. Columbus area residents preferred, but not required (all fellows should plan for a few day trips throughout the campaign!). If your college/university allows class credit for campaign work, we will help ensure the fellowship fulfills course requirements. If interested, send your resume to Zac Kramer at JoeForOhio@gmail.com. Volunteer and internship opportunities are available to help refugee clients acclimate to the U.S. and find work. The Pathways Program in the US federal government offers employment opportunities for graduates with BA degrees in political science. We have an exciting full-time opportunity for an Associate Editor-Science in our Washington, DC or Cambridge, UK office to join our editorial team at Science. We seek applicants who are scientifically rigorous and able to critically evaluate scientific work, have a great love of science and an excellent ability to network with scientists. The CCMV Project Director will be responsible for the operational success of the City Club of the Mahoning Valley ensuring seamless program development and execution. The CCMV Project Director reports to The City Club of Cleveland Director of Programming and works with both the City Club of Cleveland leadership team and the CCMV steering committee. The CCMV Project Director will produce multiple lines of forum programs, build community partnerships, develop individual membership and corporate sponsorship, manage volunteers, and shape the overall vision of CCMV programming, ensuring its local and regional significance. This is an annual, intensive five-week program held at Duke University. It is designed to introduce to the world of doctoral study in political science those undergraduate students from under-represented racial and ethnic groups or those interested in broadening participation in political science and pursuing scholarship on issues affecting under-represented groups. Apply here. This past weekend, the CWRU Model UN team traveled to Philadelphia to compete at the University of Pennsylvania Model United Nations Conference. Eight of our top delegates put on strong performances, and POSC major Siddharth Hariharan won the award for Best Delegate, representing Chen Muhua, Vice Premier, in Deng Xiaoping’s Cabinet in 1976. 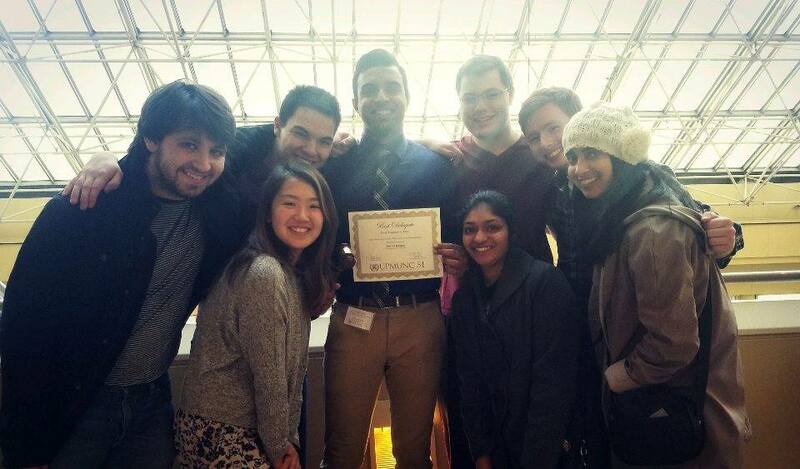 Congratulations to Sidd and to the entire Model UN team!